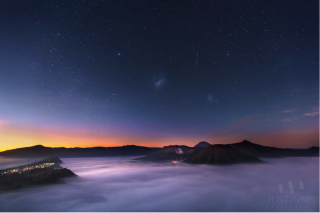 Large and Small Magellanic Clouds together with Canopus were captured during sunrise in Mount Bromo on Sept. 9, 2013. Editor's note: Justin Ng is a professional photographer based in Singapore who is no stranger to the night sky. He organizes astrophotography expeditions in Malaysia and Indonesia for dedicated stargazers. Here, he shares a first-person look at his most recent expedition, a trip to Indonesia's volcano Mount Bromo last September. After seeing incredible sunrise photos of Mount Bromo — an active volcano in Indonesia — I decided that it was time to pay it a visit. I traveled to Mount Bromo for three days in 2012, and on that trip, I took my first image of the Milky Way. I realized Mount Bromo has a lot more to offer to avid astrophotographers and stargazers than just the awesome sunrise. After May 2013's trip, I developed a Web-based astronomy tool to increase the chances of getting good images and time-lapse by calculating the best time to visit a location, and also to determine the amount of time we have left to capture a celestial event based on real-time weather conditions and other factors. A single exposure shot of three native Indonesians warming themselves up on Mount Bromo under harsh weather conditions on Sept. 8, 2013. In September 2013, I led two astrophotography expeditions to Mount Bromo to photograph the Magellanic Clouds, Southern Taurid meteor shower and the zodiacal light phenomenon during the autumnal equinox in the Southern Hemisphere. September was also the best month to see four galaxies — the Large Magellanic Cloud, Small Magellanic Cloud, Andromeda and the Milky Way — within one night on Mount Bromo. The temperature on Mount Bromo during that first week of September was the coldest of all my other expeditions. It was between 32 and 41 degrees Fahrenheit (0 to 5 degrees Celsius) and conditions worsened with strong winds. My second and most recent astrophotography expedition to Mount Bromo for three days at the end of September 2013 was challenging. I had a sore throat, fever and I felt like I couldn't speak. Like all my other trips to Mount Bromo, the tour itinerary and shooting locations were only decided on the spot based on real-time weather updates. Transport and meal arrangements were all made at the very last minute, too. I was fortunate to be able to work with the native Indonesians who know me well and are familiar with the way I work. They were able to act on my last-minute requests very quickly to ensure we can be always at the right location and at the right time to capture the essence of the scene. Behind the scenes image taken in May 2013 of the astrophotography expedition at Mount Bromo. Photographers endured more than eight hours of shooting under the Milky Way galaxy at a temperatures between 5 to 8 degrees Celsius. If the peak was foggy, we wouldn't be able to cancel our jeep bookings and we will not be able to get down until after sunrise. Therefore, it was important that we headed up there when weather conditions were favorable. The main objective was to capture Southern Taurid meteors above the beautiful landscape of Mount Bromo before sunrise. Capturing the zodiacal light phenomenon as well as the Milky Way galaxy and three volcanoes — Mount Bromo, Mount Batok and Mount Semeru — was also one of the main objectives of this trip. It was crucial that the skies remain clear all the way to the horizon so that we were able to capture the false dusk colors. However, it was very cloudy in the afternoon the day we were scheduled to ascend, but knowing that the skies would clear in the evening, I made a decision to visit the best location to capture the zodiacal light. I had our dinner packed and delivered to the location. Justin Ng's first star trails shot in Mount Bromo in April 2012. Zodiacal light is best seen in spring and autumn so I chose to visit Mount Bromo during the autumnal equinox in the Southern Hemisphere, thinking that the zodiacal light would appear behind the cones of the volcanoes. If I had visited Mount Bromo during the vernal equinox in the Southern Hemisphere, zodiacal light would have appeared before dawn in the east. You can also see a time-lapse video of the zodiacal light from Mount Bromo. The image of zodiacal light was captured when the sun was around 15 degrees below horizon and the sky was reaching its astronomical darkness condition. Zodiacal light appears as a faint light coming from Mount Batok pointing toward the Milky Way, but it's actually pointing toward the pathway traveled by the sun and the moon as they journey across the sky. There was a 60 percent chance to encounter the sea of clouds the day of the zodiacal light shoot, so I made special arrangements to get the group up to the crater before sunrise on our last night in Mount Bromo. Indeed it happened! We were all excited to start our journey to Mount Bromo's crater from under the sea of clouds on horseback. When the visibility of Mount Bromo's crater was getting better during the journey upward, I knew we were above the clouds. I was totally in awe of the magnificent view behind me then. The astrophotography expedition concluded with great success and with many of us having captured the zodiacal light on Mount Bromo for the first time under harsh weather conditions. We plan to go back again this year for other amazing captures! You can see more of Justin Ng's photography at his website here.